Wait, this is it? Were done? This is the last week? What're we all going to do? We're going to the playoffs, that's what were doing! Well, Atlanta and Edmonton aren't, but everyone else is. We've even got all the seeds finally set as well, even though it took to the final week. But we'll go over that after we talk about the games. Let's talk about how we got to the playoffs in this, the final week of the regular season of the NASL. Atlanta before this game had won two out of three, and made it three out of four after this game, beating the San Antonio Scorpions at Atlanta Silverbacks Park with 2,357 fans coming out to watch. Atlanta wasted as little time as possible, in fact they only wasted a little less than three minutes, as a Danny Barrera corner kick found the ol' noggin of Silverbacks defender Willie Hunt to put the Silverbacks up 1-0. The Silverbacks decided they weren't done in the first half, as a well placed Danny Barrera free kick found the head of Blake Wagner and into...wait. Blake Wagner? The Scorpions defender? Yeah. In Wagner's defense it was a fantastic header, as Daryl Sattler had no chance on the ball. The Scorpions, Josue Soto specifically responded in a big way early in the 2nd half, as he received a touch from about 25 yards out, told Silverbacks keeper Daniel Illyes his soccer-pants are ugly, and sent an NASL goal of the week shot right past a flatfooted Illyes. The Silverbacks were extremely flustered by their goalkeeper being made fun of, so much so that they decided to put the game away about five minutes later, as a fantastic through ball from Danny Barrera found Pedro Mendes, who slammed it past Sattler for the 3-1 Silverbacks win. In the other midweek game between two teams that are smoking hot(but not literally, come on people), the Tampa Bay Rowdies and Carolina Railhawks played to a draw in the other midweek game, this one held at Al Lang Stadium. It was the Rowdies who scored the first goal of the game, off a great corner kick from Luke Mulholland went to the head of Andres Arango and into the back of the net. The rather docile first half actually featured more fouls(10) than it did total shots for both teams(9). The Railhawks did not want a repeat of that in the second half, and if it wasn't for some outstanding goalkeeping from Rowdies 'keeper Jeff Antinella, the Railhawks could have easily won this game. In a successive five minutes, Antinella became the Great Wall of Antinella, stopping everything coming his way. It finally took a deflected shot by Ty Shipalane off a Rowdies defender to beat Antinella in the 61st minute. The Railhawks amassed a total of 11 shots in the second half, and probably deserved the win with their play in the second half. But with the final scoreline of 1-1, the Rowdies were able to clinch a bye into the Semi-finals, regardless of the weekend results. The Islanders didn't have much to play for here, as by this point, they knew they were not getting the bye into the semi-finals. But, pride is always a thing, especially in front of the home fans, and a win would keep them locked into the third seed, which will play the sixth seed come quarterfinal time. The Silverbacks...well...they only have pride to play for. Which is probably could for the playoff teams, as the Silverbacks have been playing extremely well as of late, undefeated in the month of September. They kept that streak alive in the final regular season weekend, as they drew the Puerto Rico Islanders 1-1 at Estadio Juan Ramon Loubriel. As it has been of late, the Silverbacks drew first blood on an absolute screamer from Danny Barrera from around 28 yards out, and I'm sure this goal played a part in Barrera winning NASL offensive player of the week awards. The Islanders, playing with the added weight of CONCACAF Champions League play, found their equalizer though in the second half, as a Hector Ramos shot smashed off the crossbar and right to Justin Fojo, who whipped it nicely around Silverbacks 'keeper Eric Ati. No, your eyes aren't deceiving you. The NASL scheduling gods actually had these teams play back to back in the final two weeks. It seems like a huge positive right? Two teams that are playing extremely well heading into the playoffs, facing off twice in the last two weeks of the season. Well, these guys didn't get the memo, as they both put up donuts in the replay game at WakeMed Soccer Park. As is typical with these type of games, both teams came away with good chances to score. The Rowdies should have scored first in the fourth minute, when Rowdies forward Carl Curt got a 1v1 with Railhawks 'keeper Ray Burse, but Burse made a great reflex save and killed the attack. If the Rowdies should have scored, I don't even know what to call what happened to Carolina in the 23rd minute, as Railhakws midfielder Austin Da Luz played a perfect pass across the face of goal to forward Matt Luzunaris, who promptly skied the shot from just outside the six yard box. The second half brought more of the same, although the Rowdies got even more sloppier in the second half. During both halves, the Rowdies had more fouls(10/14) than shots(7/6). Unfortunately for the Rowdies, the result guaranteed the San Antonio Scorpions would be the overall regular season NASL winners, as they needed to win, and have San Antonio lose. The Strikers were looking to go into the playoffs on a high. A good road win against a team that won't be in the playoffs would be a very good start for a playoff push, but sadly, they could only come away with a draw, playing the Eddies to a 2-2 tie at Clarke Stadium with 1,392 Eddie diehards in attendance. Fort Lauderdale scored the first goal on, what looks like at least to this writer, a rather soft PK, with Abe Thompson beating Eddies 'keeper Lance Parker. The Eddies tried to level in the first half, as Eddies midfielder Dominic Oppong became open in the middle of the field, but could only shoot the ball right at Strikers 'keeper David Martin. The Strikers took a 2-0 lead late into the second half as a nice through ball from Abe Thompson found Strikers forward Aly Hassan, who chipped Parker for the goal. A combination of bad defense, and some bad luck left the Strikers feeling down at the end, and it started right before full time, as fringe Eddies player Elvir Gigolaj sent an absolute laser by Martin to pull it back within one. The Eddies completed the comeback as Paul Craig completed a great low shot from just outside the top of the 18. It should also be noted that the Eddies are moving quickly this off-season, releasing four players , most notably midfielder Ilja Van Leerdam. This game was merely a victory lap for the Scorpions. The Rowdies had already drew in their game earlier in the weekend, so that meant the Scorpions had clenched not only their bye into the semi-finals, but also the regular season title. But the Scorpions couldn't notch the victory, only managing a 1-1 draw with the Minnesota Stars with 7,996 in attendance at Heroes Stadium. It was a regular scene at Heroes for the first goal, as Pablo Campos received a through ball from defender Ryan Cochrane, and calmly slipped it past Mitch Hildebrandt. The goal was Campos' 20th of the season, which put him five goals ahead of his closest rival, Nick Zimmerman of the Carolina Railhawks. But Minnesota got to play spoil sport, and in the 69th minute, with the ball bouncing around like a ping-pong ball, Stars defender Kevin Friedland found himself with the ball at his feet and got the ball into the back of the net. Here are your final NASL regular season standings. Before we get into the playoff match-ups, I wanted to give a rundown of how the NASL playoffs work. As you've probably already figured out, the Scorpions and the Rowdies get to skip the quarterfinals, and what basically amounts to one-game playoff. The three seed goes up against the six seed, and the fourth seed goes up against the fifth seed. So, the Islanders will face the Stars, and the Railhawks will go against the Strikers, with home field advantage obviously going to the higher seeded team. The lowest seeded team to come out of those games will face the Scorpions, and the higher seeded team will play the Rowdies, with both being an aggregate home and away series. 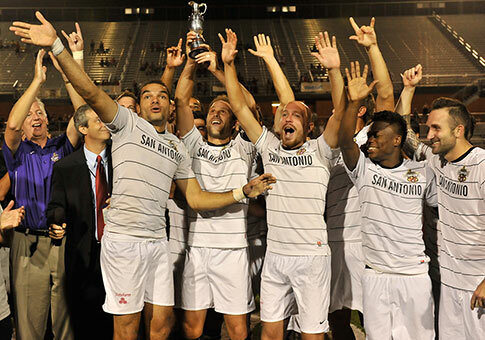 Obviously, the winner of those games will play a home and away series for the NASL Soccer Bowl title. Any required overtime will be the standard 30 minutes of extra-time, followed by penalty shootouts. Got more playoff questions? Predictions? Wildly and grossly inaccurate opinions? I value them all! Come find me on twitter @DoakGips and lets talk about the NASL.